Kitchen Arts & Letters is the country's largest store devoted completely to books on food and wine. With more than 12,000 titles in English and other languages and access to thousands of out-of-print titles, we help food professionals, scholars, and the food publishing community, as well as the general public, discover books--older and recent--that represent serious contributions to the world of food and drink. This is a highly selective list of new titles published during the fall of 2009, as well as some other recent arrivals. Most will be available when you receive this list; others are forthcoming and will become available later. All information for unpublished titles is tentative, including price. 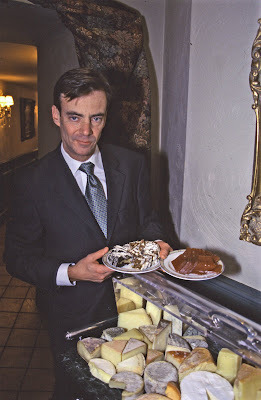 Ferran Adrià, et al. COCO. 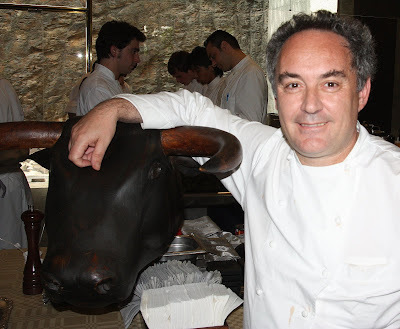 Ferran Adrià in the kitchen at El Bulli. Photo by Gerry Dawes©2008. Coleman Andrews. THE COUNTRY COOKING OF IRELAND. Lidia Mattichio Bastianich. LIDIA COOKS FROM THE HEART OF ITALY. Rose Levy Beranbaum. ROSE'S HEAVENLY CAKES. Heston Blumenthal. THE FAT DUCK COOKBOOK. Scenes from Madrid Fusión 2009: Molecular Cuisine, Does It Exist? The Fat Duck's Heston Blumenthal ponders the question. Lourdes Castro. EAT, DRINK, THINK IN SPANISH. David Chang and Peter Meehan. MOMOFUKU. David Chang of Momofuku (NYC) and Gerry Dawes on stage during Madrid Fusión 2009. Rozanne Gold. EAT FRESH FOOD. Thomas Keller. AD HOC AT HOME. Thomas Keller, Madrid Fusion 2009. Max McCalman and Dave Gibbons. MASTERING CHEESE. Paula Wolfert. MEDITERRANEAN CLAY POT COOKING. kitchens at the Worlds of Flavor Conference, Nov. 2009. HOW TO ORDER From Kitchen Arts & Letters. We'd love you to come to the store, chat with us, and see our full selection, as well as (in many cases) publishers' galley proofs and other material on upcoming books. If you must order by mail or fax, please let us know which titles you want. If the books are current and available, we'll ship them right off. If they are not available, we'll let you know when they arrive and notify you of the costs. SHIPPING COSTS. We ship by UPS or USPS, whichever is least expensive for your location. Shipping is minimum $7.25 in the New York metro area, $8.00 east of the Mississippi, and $9.00 for southern Florida and the rest of the United States. For multibook orders, we will notify you of shipping costs. For overseas orders, we'll calculate costs by country. PAYMENT. Mail order payments by Visa, Mastercard or Discover. On telephone orders, we can also give you a total and you can send us a check. For foreign, we'll take credit cards on all orders. For Canada, credit cards are fine, but no Canadian checks, sorry. US$ money orders are accepted. THE STORE is located at 1435 Lexington Avenue in New York City, between 93rd and 94th Streets. Our hours are Monday, 1-6; Tuesday to Friday, 10-6:30; Saturday, 11-6. During the summer months our hours are less regular and we are closed on Saturday. It is best to call in advance of a visit. HAVE YOU HAD A CHANCE TO VISIT OUR HANDSOME NEW WEB SITE?